PASIG—Valencia City Bukidnon-SSCR scored its breakthrough win in the 2019 PBA D-League, repulsing Marinerong Pilipino, 110-104 in overtime Thursday at Ynares Sports Arena. 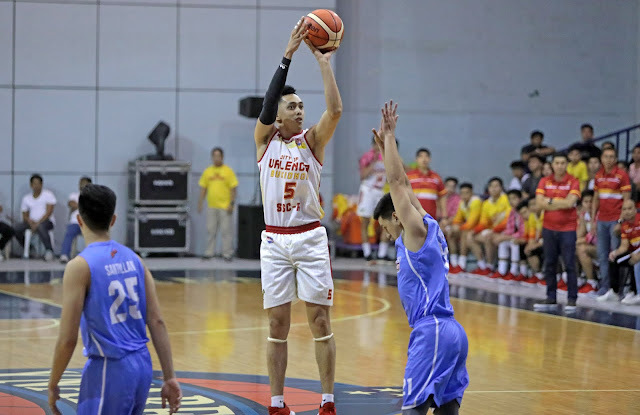 Allyn Bulanadi starred for the Golden Harvest, dropping a game-high 32 points, 12 coming in the big 28-point third quarter assault for his side before scoring four more to put the game away in extra time. He also had nine rebounds, three blocks, and two assists as he emerged as the new go-to-guy for San Sebastian. Coach Egay Macaraya, though, felt that the credit shouldn't be given solely to Bulanadi given how good the team recovered after squandering a 14-point fourth quarter lead. "Isang factor si Allyn, but everybody, noong extension, hindi nag-give up ang mga bata. I guess yun ang bini-build namin ngayon, building character ng Baste," he said. "Nakita ko na di kami nag-give up and that's the very thing na I'm very happy." Valencia-SSCR looked poised to run away with the win after taking an 84-70 lead, but Mike Ayonayon and Art Aquino conspired to bring Marinerong Pilipino back in the game and tied it at 100 just as the regulation clock expired. But Bulanadi had other plans as he commanded the finishing kick the Golden Harvest needed to score the breakthrough and gain the first victory in the Foundation Group. RK Ilagan also added 28 points on a 5-of-9 shooting from threes, while also collecting seven rebounds, six assists, and three steals, while JM Calma scattered nine points, 10 boards, and two dimes for Valencia-SSCR. The loss spoiled Ayonayon's 23-point night, as well as the 19 points and five rebounds from Aquino as the Skippers fell on their season opener. VALENCIA-SSCR 110 -- Bulanadi 32, Ilagan 28, Calma 9, Villapando 8, Capobres 7, Dela Cruz 6, Are 5, Altamirano 5, Sumoda 4, Desoyo 3, Bonleon 3, Calahat 0, Tero 0, Loristo 0. MARINERONG PILIPINO 104 -- Ayonayon 23, Aquino 19, Wamar 15, Rodriguez 15, Santillan 12, Asistio 9, Mendoza 6, Reyes 3, Serrano 2, Victoria 0, Bonifacio 0, Bunag 0. Quarters: 30-26, 50-53, 78-68, 100-100, 110-104.